CYBORG:Lee Majors Online | Press Room | No Need For L.A.
Tubbs is looking tired. And a bit cold in the Crabapple woods. Philip Michael Thomas, famed for co-starring in TV's "Miami Vice," stands in a patch of damp leaves watching Eddie from "Eddie and the Cruisers" -- actor Michael Pare -- dart across the forest with a pistol. The target of their hunt is none other than the "The Six Million Dollar Man" Lee Majors. What could possibly corral this where-are-they-now celebrity crew to the edge of north Fulton County? "Fate," a $2 million film that began shooting throughout Alpharetta and nearby locations nearly a month ago. Thomas and Pare play cops on the hunt for serial killer Majors. The real story, though, is a local producer who's turning the landscape into a breeding ground for low-budget films. "There's a lot of good, quality crew here," said Ray Guthrie, president of Alpharetta-based Alpha Film Group. "You have mountains, a big city. There is no real reason to go to L.A. It's more cost effective here." Guthrie, who was in the carnival business for 35 years, has been producing, distributing and selling films globally for six years. "Ever since I was a kid I wanted to be working on movies," he said. His passion is now a bit of a boon for the local economy. Guthrie estimates that 60 percent of the film's budget is being poured into local businesses. Merchants aren't the only ones lending a hand. Filming recently took place inside the Alpharetta Police Department complex, said Sgt. Chris Lagerbloom, the department's spokesman. "They did some shooting in our non-administrative building in our communications center area," said Lagerbloom. The department has also tried to help production crews and residents smoothly coexist. Apparently, production trucks and vans have troubled residents during production. But for the most part, the community has been cooperative. "This is my first film where everything has gone smoothly," said director Ace Cruz, who previously helmed such titles as "Psychotic" and "Urban Task Force," according to the Internet Movie Database. "There's been a lot of support from Alpharetta, the hospital, police and paramedics." The film is also giving a shot to aspiring entertainment types. Keith Walker of Flowery Branch sells cars as a full-time job. On the set of "Fate," he's in costume as a police officer. He's also an associate producer on the project. "I'm ready for the next one," he said, phoning a friend in an attempt to secure a police car for another scene. He won't have long to wait for his next celluloid adventure. Guthrie has at least two more films in the works that are set in north Fulton. In April, he'll shoot "Run," the tale of a retired hit man fleeing from the mafia. He plans to, in about a year, produce a film about a "terrorist carnival." Meanwhile, "Fate" must be finished. Two main characters, Pare and Thomas, are former partners reunited by Majors' killing spree. Guthrie calls it a "psychological thriller" with a "big twist at the end" that he wouldn't reveal. Pare polishes off his scene chasing Majors' stunt double through the woods. Majors, whom Guthrie said had a bad knee, stayed away from the main set. The former Steve Austin typically refuses interviews until day's end. Inside a nearby home, an actor gets prepped for his small but memorable role as a burned-up corpse, apparently part of Majors' body count. 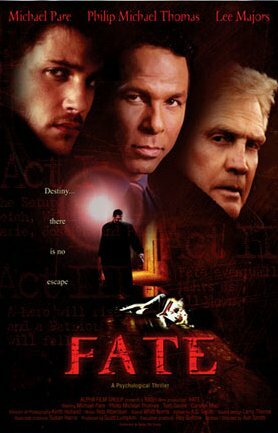 When shooting wraps on "Fate" for the day, the crew will head to a gold mine in Dahlonega for a scene where Majors terrorizes the two cops. "You can't find a gold mine in Encino, Calif.," Guthrie said.